We are proud to announce that the Coral Sky Homeowners Association has selected Tinnelly Law Group as their association’s legal counsel. 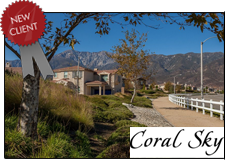 Coral Sky is a brand new single-family home community in the city of Rancho Cucamonga being developed by Pulte Homes. Coral Sky is a small enclave of 53 homesites ranging in size from 20,000 sq. feet to 43,000 sq. feet (1 acre). It’s spacious, single-story homes will feature amazing layouts with unique features such as pristine courtyards, casitas, and cabanas. Coral Sky’s residents will enjoy equestrian trails and scenic community walkways, as well as gorgeous mountain and city views. Our HOA lawyers and staff look forward to working with Coral Sky’s Board and management.